• Leverage cloud capabilities, e.g. elastic capacity, resiliency, etc. • Where to start? How to make this happen? • How to retrofit these principles to existing services? 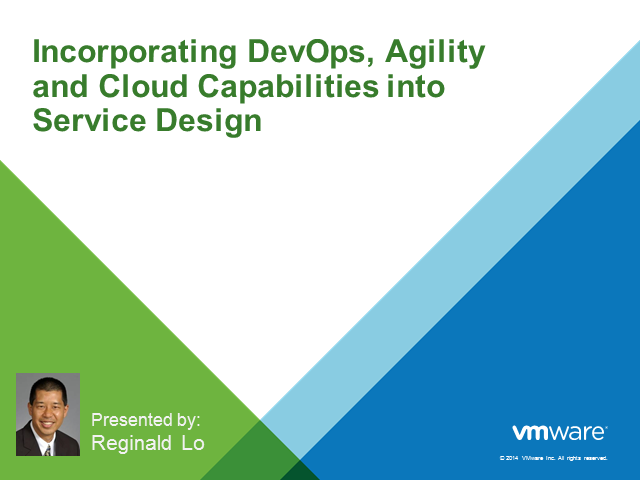 Reginald Lo, Director of Service Management, Accelerate™ Advisory Services, VMware, Inc.
Richard Hawkins, Transformation Strategist, VMware, Inc. In 2014 we saw a significant new focus on processes and technologies that enable the strategic alignment of IT with the business. Though business and IT alignment has been a perennial goal for IT organizations for decades, the recent strides that have been made to improve the delivery of cost transparency, service brokerage and enhanced time to market for IT services have enabled new ways to communicate with the business and deliver the innovative, agile and cost effective services that they demand. VMware's Accelerate Advisory Services practice works with organizations to address the people, process and technology aspects of IT as a Service transformation, enabling our customers to deliver agile, on-demand IT services that meet and exceed their customer requirements. Presented by: Reginald Lo, Director of Service Management, Accelerate™ Advisory Services, VMware, Inc.